General Information Bromeliads are a unique and fascinating family of hundreds of exotic plants, which are hardy and easy to grow. They are amazingly adaptable and will tolerate a considerable variety of conditions of light, air and moisture, indoors and outdoors. Their use in landscaping and shopping centres is evidence of this fact. The plants are native to the Southern States of the USA, Central America and deep into South America. Bromeliads (pronounced brom-eel-ee-ad) grow on the branches of trees (epiphytes), cling to rocks (saxicolous) and grow on the forest or desert floors (terrestrial). Some are only 2.5cm in size, others up to 10.5 meters and all sizes in between. They are found growing in humid sea level jungles, wet cloud level forests on mountains, low coastal slopes and dry deserts. The scales, which cover the leaves on bromeliads, are wonderful moisture absorbing organs which often form attractive bands and patterns. The edible pineapple (Ananus comosus), old man’s beard or Spanish Moss (Tillandsia usneoides) are well know bromeliads. Queens tears (Billbergia nutans), the match stick plant (Aechmea gamosepala), the colourful Billbergia pyramidalis variety concolor and others holding water in their vase like cups have been growing for many years. However their are many other exciting bromeliads that can be grown by any gardener, even those without “green thumbs”. The more favourable the conditions and the closer these conditions are to the natural habitat the better the results will be. The process of sharing knowledge and learning together are great attractions of belonging to a friendly group such as the Bromeliad Society of the Sunshine Coast. 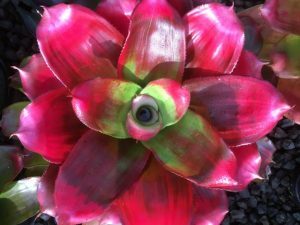 Light is a most important factor in growing beautiful bromeliads. The best character and colour is obtained when the plants are exposed to good light for as many hours a day as possible. Some can be grown in sunlight (e.g. Dyckias, Hechtias, some Aechmeas) but most will suffer bleaching and burning of the leaves in direct sunshine. 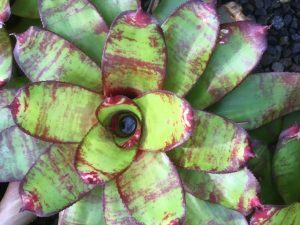 In the garden and home bromeliads will grow happily, in shade houses, in or under trees, on patios or verandahs, near windows, glass doors or other well-lit or well-ventilated locations. Two or three or more waterings per week in the warm to hot months is recommended. Water less in the cooler weather, once a week or less. In hot, dry conditions daily watering would be desirable. Maintain a reasonable level of humidity. As a general rule (there are exceptions) bromeliads will tolerate temperature from 38 to 10°C. Some need to be protected where frosts are experienced (e.g. Cryptanthus and some green leafed Tillanasias). In their natural habitat this family of plants depends upon nutrients from the air and those which have cups draw theirs from leaves, dust and insects which fall into the water. Terrestrials and pot grown epiphytes draw nutrients from their roots as well. 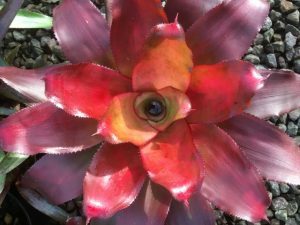 Bromeliads can be grown successfully without the use of fertilisers, however their judicious use can be beneficial. It is most important to use a potting medium which is porous and slightly acid, able to hold moisture without becoming soggy. Combinations of materials such as fine pine bark, peat moss, peanut shells, rice hulls, charcoal, plastic foam granules, coarse sand and perlite provide these requirements. Terrestrial bromeliads (e.g. Dyckia, Cryptanthus) will need some compost or leaf mould. Be sure to choose a pot to suit the size of the plant. Do not overpot. There are many epiphytic species (air plants) which thrive when mounted on cork, branches or roots of dead trees, or in the forks or branches of growing trees (eg Neoregelia compacta, Aechmea nudicaulis, Aechmea orlandiana etc and of course most of the Tillisansias). A great variety of Tillisansias are available and grow into fascinating specimens after being mounted by glueing or tying with strips of stocking material. Bromeliads are reproduced by seeds, tissue culture and offshoots. Seeds can be germinated and grown on, but these can take a long time to mature. However most plants produce offshoots or “pups” and these can be easily severed. Remove these when they are about one third the size of the “mother” plant and pot or mount as described above. Recently plantlets have been mass produced by tissue culture. Initially these microcuttings range in size and length, with 2 to 3 leaves and some root initiation. They are packaged in sealed plastic containers containing specially formulated agar media for transporting around the world, for mass horticultural production, after handling and hardening off. 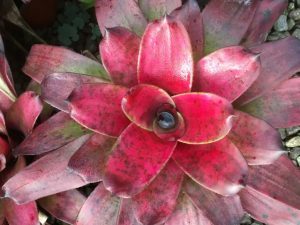 Because many bromeliads take many months to years from seeds or tissue culture before they are ready to sell, many plants are sold at about ¾ size, when they are not fully grown. Some commercial growers “treat” their plants to induce flowering. Groups of plants that have reached a saleable size are “gassed” with ethylene or similar. This gas treatment forces the plants into flower in approximately 10 to 14 weeks.